Quorn (chickeny flavour) with veggies and mushrooms. I was too hungry to let it finish cooking so the pastry is slightly under done. The broad beans were cut fine but they were stringy. 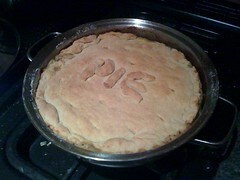 Apart from that it was a very tasty pie and enough for tonights dinner too. other things I should catch up on. Thursday last week Mary came to visit for the evening. I went to the station and we took a cab home, then I drove to knit night. We stopped and had Pizza first and then got together with the ladies for a quick knit. We could not stay long but it was lovely to spend some time with Mary and allow her to get out and about a little. It was exactly two months since my wedding day and we had a good chat about how it all was. She reminded me what a beautiful wedding I had because lately its more about loosing mum and she did confirm one thing I was wondering about. Mum did not look or have any outlying proof that she would be dead within the week of my wedding day. Amazingly I found that heartening. She was amazing, right to the end. I am just about at the stage now where I can appreciate how special she is and was, and how great a wedding day I had. I have to thank good friends like Mary for that, reminding me its not all about missing them, its about celebrating and spending what time we can with friends. Anyway on to other weekend and all that activities. Saturday we washed the cats, they were getting a bit stinky and needed it. Photos are on flickr and in that post down there that was dropped in by flickr. The boys were amazing and accepted the light warm raining that Scotty gave them. No loud meows, no struggling and both were very happy after that they were clean, fluffy and looking handsome. I baked some more and made two batches of cakes. One fully successful and the other not so much. Lemon ginger cupcakes were fab. Carrot and sultana not so much. The lemon ones were so good I baked a second batch on Sunday just to take to the family. Saturday night I went out! SHOCK HORROR! Anne-Marie who blogs too, was at knitting night but I never got a chance to catch up with her. She’s getting married in December so we have a lot to talk about. I met her at the local pub and we drank chatted and knitted at the same time. I enjoyed it lots and I would love to have a pub knitting group. Next time I must remember not to take the lace knitting. Far too complicated whilst chatting and drinking. Sunday we went over to the coast and all the kids and my brother and sister were there. Dad pulled out all the stops and managed to cook a full chicken and veggie roast for 11 people. A couple of us pitched in a little but it was mostly his doing. He has confirmed he had a lovely time on holiday with the twins and my brother. I unfortunately was feeling all out of sorts and left early before anyone could tell me if they liked my cakes. We were off on a walk down the sea front and only ladies can understand that lurching feeling when you’re not prepared for your bodies functions. Which brings me neatly on to my personal body issues. PLEASE if you don’t want to hear about ladies things wait for the next update. bye! go on, you really don’t need to read it. Is reasonable. We’re not skint, not rich but able to keep going with what we have. So in order to make the best of what we have I’ve been in touch with a financial advisor to try and find the best deals out there and get us what we need, a new mortgage. The current one is for 30 years full term and we’ve only managed to cover the interest and £3000 in the past two years. Not good. Still we have alternatives and one of those is with the same supplier. Nationwide. Oh do I hear any UK people nodding and wondering what my rant is going to be about? well it surely will be a rant and surely it will be about Nationwide. Firstly, I was called early as the rates were changing so I was asked by our adviser to call Nationwide and try and earmark the lower rate of interest. Ok, easy enough. This was Tuesday. I called them and asked them to change our mortgage. Sorry we cant they said. You’ve got a block on your account and you’ve not been receiving mail because the address is incorrect. They have still been taking my money though. Plus also I had to change my name on the account so Wendesday I went to the bank and changed both. Job done, or at least it should have been. I was informed it would take 24 hours to update on the system. Thursday, I call them to change the mortgage. They said the name had been changed but not the address. Now they were claiming I had not changed it, and the postal address was still incorrect, and what was the mortgage under? a completely different address. The annoying thing is I’m not sure if it was the solicitors or Nationwide who got the address wrong but we cant change the mortgage unti this is all sorted out. By Friday we were called back by the branch and they posted out forms to sort out exactly what address they should have the mortgage under as well as our postal address which should be exactly the same. Hopefully once they get all this back I can have a new mortgage, but because its taken the best part of two weeks I’m going to make sure its with someone else. Was last weekend, and I thought I filled all this in and published it. Apparently not. Time is very much getting away with me of late and because quite a bit is happening I’m starting to miss things. le sigh. Saturday: final sort out and re-arrange. Still piled up to the heavens. I removed 3 boxes and gave them to my sister who popped over to pick them up. Sunday spent the rest of our vouchers bought wireless keyboard, kenwood processor, silicone baking trays. Then spent the rest of the day baking cakes and stuff. It was fun. I wish I took pictures of my makings. Then we played lego. Lovely. Saturday mornings are great. Just to let you know we don’t do this often. It is still a little cruel but when they smell they need it. About once every couple of months. Damn, I’ve been keeping notes and trying to write up an publish more often BUT just as I go to publish I get waylaid and miss it. So to cover what I have missed here’s a bullet post. – I bought office for mac, but via the work sponsorship system which means I only paid £17.31 bargain. It turned up on Friday, its been installed and is working well. Shame about the updates though, they took twice as long to install than the software itself. Oh and then I noticed that my mac HD was full. only 3Gb left. YEEP! I realized it was nearly all my aperture folder of photos. I ran a backup and had a HUGE cleanup. Doing that alone cleared up 35Gb of a 75Gb HD. – sorting boxes. I’ve been through everything that was taken from Dad’s house. I’ve now got my two sewing machines, 6 large under bed boxes full to the brim with sewing fabric. 3 full of yarn, one full of felting. These have all now been stashed in two stacks in the spare room down stairs and my project is slowly coming to pass. I’ve got at least 3 bin bags full of old clothes and a good selection of “charitable donation items” which need to go to the cancer research charity shop. One day, I’ll finish sorting and I’ll have a sewing/knitting room all to myself. Then I can get creating which is what I love doing most. Firstly I will need to collect more stuff from mum’s wardrobe and go through all that. Not until next week though. – We had a visit from a financial advisor. With these trying times I must admit we’re not noticing it much. We are truley dinky (dual income no kids yet). I feel like I keep going on spending sprees but I forget most of what we get is discounted or out of our wedding vouchers. More about that later. Back on to the financial advisor, she took our details and will be coming back Tuesday night because all the rates changed when she visited and most of the banks pulled their deals. I’ve no idea how I would have sorted it all out so its nice here in the UK we have advisors who take their payment from the lender you choose so the service is free. – Dad has gone on holiday with my brother, his wife and the twins. Hopefully he’s enjoying it as much as he can, and I think its the best thing for him to get away from the house for a bit, to relax and get a small dose of much needed sunshine. I miss him right now but that’s because I cant talk to mum either. – I made it to knit night! YAY! As I’ve sorted through all the boxes I managed to take yarn donations to the group. By this I mean I handed out yarn for free but asked the person who took the yarn, in each case to give what they thought they could afford for the yarn to cancer research. I think it worked well. Most of the stash went. All the stuff I would have never ever got around to knitting with too (yes I did keep some back for me). I didn’t take photos, I didn’t count what was given away. Some of it also went to a disabled gentleman who joins our group and I’m not going to ask him for a donation. He’s going to make a blanket of squares to give to charity, what more could I ask than it all gets knitted faster than I could and put to good use. – After such a lovely night with the ladies at knit night I had a bit of a rough nights sleep. Parting with some of mums items appears to give me nightmares. Friday at work was hell. What with a completely discombobulated feeling about myself, tired and not able to concentrate a poor girl in the office got a cough. The problem was its no ordinary cough, its loud, hard and repeated every few minutes throughout the day. She was told to go home and would not. At one point she managed to cough and fall over. By this point I was distraught. I could not find it in me to tell her I heard my mum cough just like that, for the last 6 months of her life, almost constantly. Mum was eventually taught some breathing techniques to stop it annoying her but the constant reminder on a day I was less than able to cope, it broke me. I went for a quick weep in the loos around lunch time. Later two colleagues were leaving the office for good, both to head off as expats in New Zealand (they got married earlier in the year). I decided to go for a quick drink and two large vodkas with coke later and I had enough courage to stomp home and feel happy that it was a Friday night. I very very rarely drink anything but that was just what the doctor would have ordered if there was one present. well you got me. Someone reminded me today I’ve not taken a money shot of the new barnet. My long hair was like more than part of me. It became who I was known as, the girl with long hair. Well its not that short but its a lot further away from my trousers than it used to be, and for your delectation I give you me.. at work, no makeup and fuzzy. Amazingly I cut off the bottom of my hair, inserted a tree in my head and surrounded myself with boxes. DOH. Ah well at least I’m smiling. Click on the photo to go to Flickr where there is an even more dodgy but better taken photo in the work toilets mirror, where I’ve been mirrored of course. Well it looks right to me. You are currently browsing the Jiva a soul in transit blog archives for October, 2008.